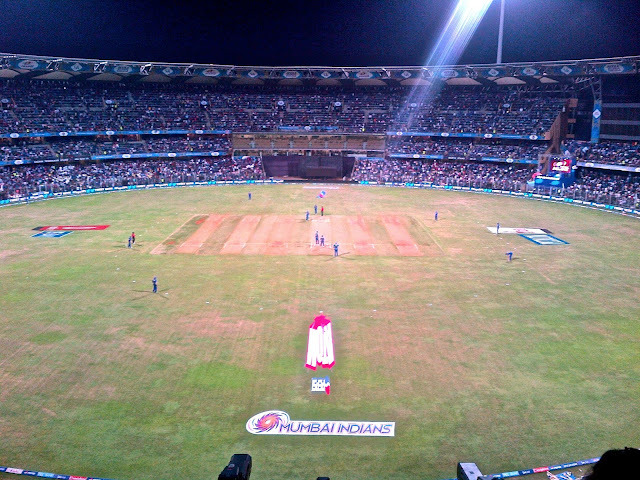 Actually - not just my first IPL cricket match, but my first cricket match ever! Coming from the land that invented cricket and then introduced it to India, that's a pretty poor show. But then again, cricket (or at least 'test' cricket) is extremely boring and the rules are too impossible for a 'girl' to understand. Boooooo!!! I hear you say! However, I recommend anyone who finds 'normal' cricket sleep inducing - as I do - to go and watch an India Premier League (IPL) match. Or at least watch it on the telly. The game is condensed into only three hours - as opposed to days for test cricket; each team has a Bollywood style cheerleading team (my favourite bit); there's loads of music and a brilliant atmosphere. Last night, we went to see the Mumbai Indians play the Rajasthan Royals at Mumbai's Wankhede Stadium (very unfortunately misnomered for us Brits - please pronounce it Venkerdy!) We were very luckily treated to some seats in the Grandstand, which included free food, beer and wine! If we had known that, we would not have bothered to get filled up on chicken kebab and cocktails at the Dome Bar prior to the game. The "Venkerdy' Stadium filled to its 45,000 capacity. Due to my camera battery being confiscated, I had to take these pictures on my Blackberry. Thankfully Sachin Tendulkar was NOT playing last night or I would have been most upset about not being able to get a close up! Of course there was the usual security farce whilst trying to enter the stadium. There were masses of armed policemen and guards everywhere, and after passing through the gate, we were virtually strip searched. I had the battery of my camera confiscated (but given back to me later) and my bag was thoroughly looted for the complimentary horns and clappers that I had been given - anything that would make a loud noise. I am not quite sure why the Mumbai Indians merchandise this stuff if you can't actually take it into the stadium. Typical. Then after passing through a bleeper, I was searched for a second time - head to toe. They rifled through my camera AGAIN and seemed to be disconcerted when I told them that my battery had already been taken. Inexplicable. To get to our seats, we had to proceed through several ticket check-points (after all, once is not enough), until we reached the third floor of the stadium. Then there was a fourth and final ticket inspection where theme-park style bands were strapped on to our wrists (which required two members of staff to put on, and which could only be taken off with scissors much to the annoyance of Mr Jules). These would identify us as 'special' people entitled to enter the free drinking and eating area...which we could surely not complain about! From here on in everything ran smoothly and once seated, we began to thoroughly enjoy the experience. Wankhede Stadium (pronounce it properly please...VENKERDY) is certainly very impressive and when filled to its 45,000 capacity - exudes an electric atmosphere. Indians are such good sports and supporters of both teams can sit together without fear of violence and retribution. Not something you may necessarily see at an English football match for example. After a thorough explanation of the rules by Mr Jules (ooh that rhymes), I did get into the swing of the game. Every time one of the sides scored a 4 or a 6 (see, I've learnt something! ), the cheerleaders - dressed in short ra-ra skirts, cropped tops and pompoms - would get up and jive to funky Bollywood music (which included 'Gangnam Style'). I loved that! Although I wish someone would explain to me why all cheerleaders in this country are white skinned - probably because western chicks are the only ones willing to bare their flesh in public? Mumbai is described as the cricket capital of India and we were especially lucky to be watching two of the top IPL teams in the country playing against each other. Unfortunately Sachin Tendulkar - the absolute No.1 'God' of Indian cricket was not playing last night due to injury, but some of the other players more than made up for that. I am too inexperienced to go into the nuances of IPL (such a 'girl'!) 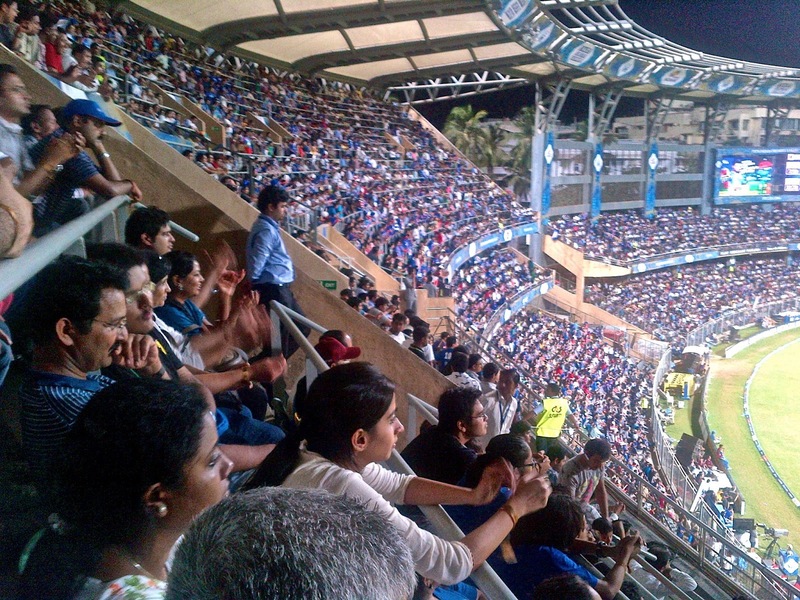 - but luckily for us - and the whole of Bombay - the Mumbai Indians won the match! Hoorah! Mr Jules is a big fan of IPL now so I bet he will be going to another match or two next year...and I definitely won't complain if he asks me to join him! Glad that you had fun!! Your neighbors from Pune have fully-clothed cheerleaders.